This is a blog post I have been musing over writing for a while. Every time I meet a new couple and talk through their wedding flowers we always start with the bouquet. I think it is such an important piece. Not only does it set the flowery tone for the day but whoever is carrying it has to absolutely love it. This may be controversial but I think loving a bouquet comes is much more important than whether it goes with the dress, the venue, the bridesmaids or anything like that. Sure, people make rules when it comes to bouquets and dresses etc. But aren’t rules made to be broken? Your wedding bouquet has to be a posy of flowers that you can only dream of. 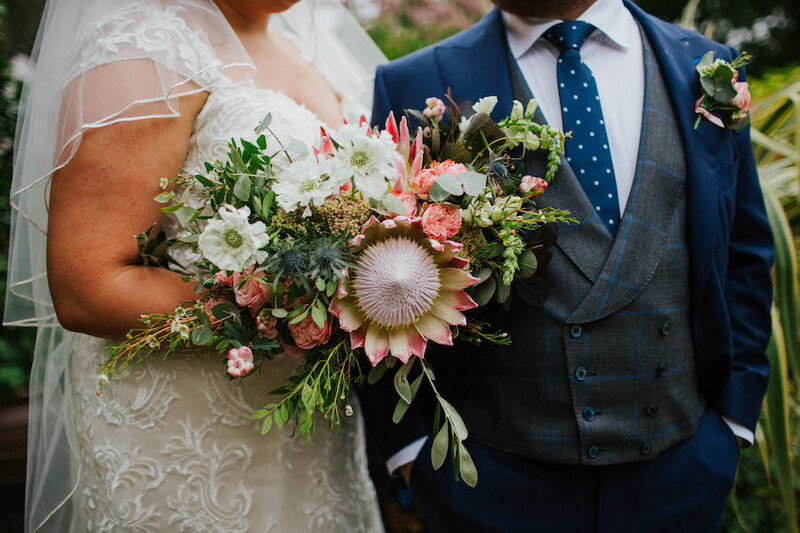 There are a few shapes of bouquet that are popular right now and I’ve decided to run through some of them with a few images of bouquets we’ve made for our real couples. The cascade bouquet has had a bit of a come back this season. It is what I would call a natural cascade. The cascade trails are made from delicate flowers such as jasmine, or a delicate drift of berries or foliage. These bouquets can be hand tied or fully wired. Both options still have lots of movement but the hand tied option is just a bit heavier than the wired version! But do remember these bouquets don’t have to be huge. They can be delicate and be full of intricate flowers or they can be large statement pieces. This is one of the most popular bouquets and it is easy to see why. It is designed as a 360 degree piece so however you hold it, it is going to look beautiful. This style is so versatile and can look vastly different depending on what flowers are used and how much foliage is used. It can be beautifully wild or restrained. This is a gorgeous style that we saw come over from America a few years ago (for those of you that love your flowers, American floral designers are ones to watch). I often describe this style as a ‘scoop’ as it looks as if they have just been scooped together on the way to the wedding. In order to achieve the stretched ‘scooped up’ look these bouquets more flowers are placed to the left and right. Your eye is then drawn to the centre and outwards. I often use delicate flowers to achieve this such as sweet peas, scabious or something delicious and scented like tuberose. These bouquets look beautiful when finished with silk ribbon streamers. Now this is where things get creatively interesting. Freeform bouquets are gorgeous bouquets that are full pieces with a bit of organised (sometimes) craziness. They will have buds or bits of foliage flying out at angles and they are definitely not symmetrical! Once again they can be as small or as large as you like, it just depends what flowers are used. They are perfect for boho brides, outdoors weddings or those who just love the natural beauty of flowers.